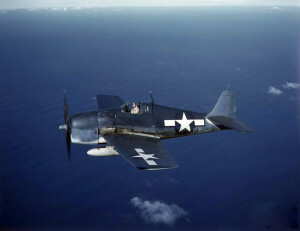 On July 16, 1943, a division of navy F6F-3 Hellcats were engaged in a “Fighter Director Practice” off southern Rhode Island when an army P-47 Thunderbolt made two passes at the group. Both passes were made from out of the sun, and each time the P-47 came within 50 to 200 yards of the division of Hellcats. According to the U.S. Navy accident report, (#44-7667), “Immediately following the second pass, Ensign Staab entered a high speed stall from an abrupt climbing turn, resulting in a vertical dive and progressive stall.” Ensign Staab, age 23, was killed when his Hellcat, (Bu. No. 25848), then dove into the Atlantic Ocean 15 miles off Point Judith, R.I.
Ensign Staab was assigned to Fighting Squadron 31, (VF0-31). His hometown is listed as Burlington, Vermont. He’s buried in Kingston, New York. The army P-47 was from the 326th Fighter Group at Westover Field. There is a notation in the report that the pilot was disciplined however, he is not identified. Rhode Island Department Of Health, death certificate.